Oliver Chavarria - English - BECA. The BECA.org Foundation. Empowering Youth Education in Nicaragua. 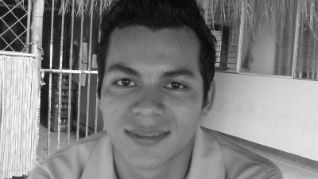 Hello, my name is Oliver Moises Chavarria Garcia one of those who was sponsored by an amazing organization called BECA.org. I am from Las Flores, which is a small community of Masaya, Nicaragua; I have lived there since I was born. When finishing my high school I was expecting to work as a construction worker since I had no money to start college. It is hard for a country guy like me to get a technical degree and even harder to be in a university. When you are from the country side the word “DREAMS” does not mean anything. However, I remember once a group of young people came to my school and what they were doing it was offering opportunities of studying. That group was part of a non-profit organization called BECA.org. Some days after BECA.org was introduced I went to apply for a scholarship. When I got the office of this organization I was given some paper work I had to fill out. In all honest, I was faithless. I thought there were so many people applying that it was going to be impossible for me to be chosen for a scholarship. However, I sure can say thank God I was selected to reach my goal. It was so exciting for me to get that piece of news. I started at BECA.org by doing social work in an elementary school for a period of three months. I got a nice experience from that time since I had to work with children and it was not that easy at the beginning, when I started getting along with the kids I fell in love with them, though. Once I ended the social work period I had to choose what to study, and it was a pain in the neck. I was not sure enough about what to study. Nevertheless, I was offered to get an English course so I could work in a call center. Even though I was not quite sure if that was what I wanted, I took it. I remember that within the course we caused so many problems to Walter, who was our coordinator and founder of BECA.org, and also we did to the team. We got into troubles many times at a point in that Walter decided to terminate the course. Though some of us were so upset for that decision, we, then, realized it was the right thing to do. Thanks to Walter’s decision we started to apply for a job in a call center. I'm grateful to Walter in a way that I cannot explain with words and so I am with BECA.org team. I applied more than four times in different call centers; I was rejected in some tries, and I was offered pre-hire courses in others, but I went to apply one very last time on December 23, 2013 at ACCEDO TECHNOLOGIES and I did it. I got the job that same day. It was hard for me at the beginning since the campaign I am working for had had a data breach and more than one hundred and twenty millions of credit and debit cards were affected. I remember once a customer told me my name was taken to the police just because I was working with thieves. After two weeks taking calls I wanted to quit since the queue was horrible. Conversely, I never quit the job, I did my best and I have been working for six months already. First of all, I thank God because He is the one who strengthens and encourage me every day. I thank Walter to always think the best for us; I thank the sponsors who helped us to reach our goal even though they do not know us, thank you BECA.org team for everything. I also would like to thank a very important person that I will never forget, that person is Antonio Rodriguez who was one of the main pillars in the process of reaching my goal.